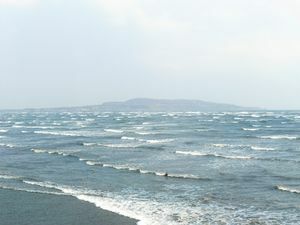 The locations are around Dublin Bay, from Howth in the north to Sandycove in the south. 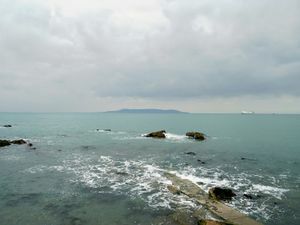 Sandycove is home to the Martello tower that features in the opening episode of Joyce's novel, Ulysses, and the famous Forty Foot pool where Buck Mulligan goes to bathe. People have been swimming there, in all seasons and weathers, for over 200 years. When I took these photographs in April 2013, a bitter east wind was blowing and the sea was very cold. The regular Forty Foot bathers are a hardy lot, however, and they advanced purposefully into the water without flinch or pause. Some swam for 10 or 20 minutes, others went in for a quick and bracing dunk - 'doing a teabag', they call it. 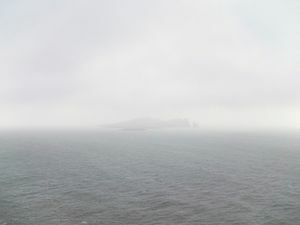 A number of the photographs are single images inspired by a phrase or place in Ulysses. 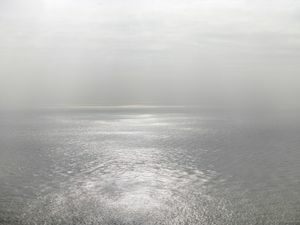 The view towards Howth from Sandycove brought to mind the memorable phrase, "The snotgreen sea. The scrotumtightening sea." 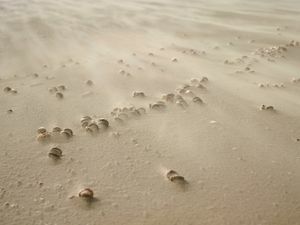 And the image of wind blowing sand over seashells on Sandymount strand reminds me of a reflection of Stephen Dedalus: "A very short space of time through very short times of space." Dublin Bay is a fascinating and varied area, with well-to-do suburbs and Georgian terraces, ferries and container ships coming and going into Dun Laoghaire and Dublin port, the peninsula of Howth and its wild cliffs and splendid lighthouse, the industrial neighbourhood of Ringsend at the mouth of the Liffey. In the strong easterly wind, the waves came galloping in with the rising tide over the vast strand just as Joyce described them: "The whitemaned seahorses, champing, brightwindbridled, the steeds of Mananaan." 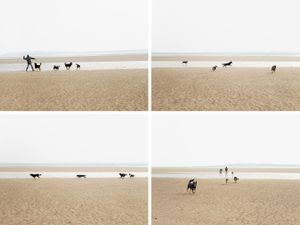 Another group of pictures plays with the idea of 'time frames' - a phrase that describes how the stream-of-consciousness passages in Ulysses switch between different moments in time and from one intensely focused observation to another. Two triptychs show bathers at Sandycove, while a third is inspired by Dedalus' great question: "Am I walking into eternity along Sandymount strand?" 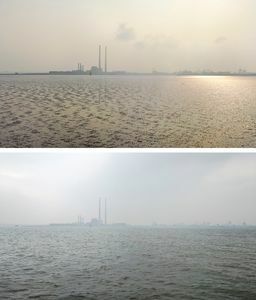 The last group of photographs is a continuation of my ‘Sea Change’ project and compares low- and high-tide views towards the soaring chimneys of Poolbeg power station, colloquially known as the Pigeon House. In Ulysses, Dedalus "turned northeast and crossed the firmer sands towards the Pigeon House." Originally a military barracks, the Pigeon House became Dublin's first power station, generating electricity from 1903. 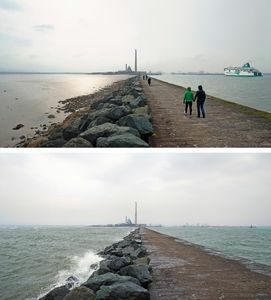 It is located at the mouth of the Liffey, where the Great South Wall extends far out to sea to protect the approach to the port of Dublin. Today's successor power station was built in the 1960s around the original. Its chimneys are amongst the tallest structures in Ireland, over 680 feet high, and draw the eye from all round Dublin Bay.